mine to be an offering to lord and humanity. send a note back with this ref. SvaSo back so i know you got this. Thank you so much for your mail. I'm Mr.Evangelist Ailbeart Cameron, I lived my life (financial-wise).My failing health, which had indicated to my doctor that i would not last for the next four months according to medical expert. My cancer has reached critical stage and i need you to work fast on this. Telephone calls from me cannot be possible at the moment based on doctors advice (Esophageal cancer affects the throat). I am currently in Airy hall Day Hospital, Aberdeen, Scotland. I prayed to the lord to give you the grace to complete this divine project for the benefit of the less privilege. I also would like to let you know that this is a straight forward and legal task. I hope my first email did not embarrass you? if it did, I apologies for this. The fund in questions is privately kept with a financial institution in London and i want to put it in capable hands for disbursement, my relatives have plundered so much of my wealth after my wife death and my illness got deteriorated. I cannot live with the agony of entrusting this huge responsibility to any of them. It is for this same reason i have randomly searched through the Internet email directory to find somebody who has the ability to accomplish the task of passing on a privately kept fund of £8,000,000 GBP (Eight Million Pounds Sterling) to charitable organizations as he or she deems fit, since i cannot do this myself due to my failing health. It was this random search that yielded your contact email address which i sent you my first email. Meanwhile it is by grace of God we know each other and I strongly believed that God knows the reason why He chose you to accomplish this task for him and his children (less privilege and the needy). Please never you ask why? Because lord knows it all, I contacted you with good mind and good intentions believing that you will surely help me by distributing this money as I am impressed with your reply. Please, I want you to understand that this benevolence is in fulfillment of my desire and decision which I am persuaded to actualize. This funds is designated for humanitarian and Charity services with special emphasis. This must be disbursed with every appropriation accountability and prudence to the glory of the lord(Philippians 3:13-14). I want this funds to be used in the below percentage portion which i have prayed for and God has approved it divinely. (1) 70% Of the Total funds should be used to support any Charity Foundation to cater for the Less Fortunate Person on earth. (3) 10% Of the Total Funds will be used to settle all expenses you shall incure in this process which is to be deduction from the funds contained in the Consignment before you can embark on the Charitable Project and i am making this proposal in accordance to God's Direction while you must remember to keep every of this arrangement/transaction restrict from third party for security reasons. If you will be capable to handle this divine project, Please reconfirm your full information immediately so that I can swear to an affidavit on oath from the High Court Of Justice here in London-Uk that will officially and legally approve you as the next of kin to this funds amount (£8,000,000) claim/received from the bank,so that even if I am no more, your claim to the funds will not be in doubt. I will be sending you the certificate of deposit of this fund immediately after the affidavit is ready. All the necessary documents required to get the Funds out of the Bank are in my possession and I will be sending them to you after we must have come to an agreement and all I require from you is your total honest cooperation to carries out my very last wish/WILL indeed. I await your prompt response to this mail.Please always remember me in your daily prayers, and may the Good Lord add more anointing upon you,and give you more wisdom to handle this project to his own Glory (Philippians 3:13-14) Ensure you reply this letter and the needed information immediately so that I will take my final decision. I hope all is well with you and other members of your family to the Glory of God. I received your information, I will swear to an affidavit on oaths from the High Court Of Justice here in London-Uk in your name which my attorney has started the process and I want to let you know that this funds will be under your control towards humanitarian and charity services including the propagation of the gospel (Numbers 6:23-26),I am very happy for your re-assuring and encouraging letters. I also appreciate your time and effort to the success of this project while I advised you to please commit more effort as I have a great confidence in you. I am trusting you to channel this fund accordingly (Deuteronomy 28:1-14) for charitable purpose,I beg you with the name of the Lord to please keep this arrangement very confidential and restrict from third party for security reasons as you are now the next of kin to this funds while the Affidavit will be ready and forwarded from the Desk Of Presiding Judge of the High Court Of Justice to Royal Bank Scotland Plc and has therefore authorized the Royal Bank Scotland Plc to transfer my funds to you, while I advised you to please Cooperate with the bank as i am in guiding you with prayers. Name of bank =: ROYAL BANK OF SCOTLAND PLC. Always remember me in your daily prayers and as well be advised to please Cooperate with Mr. Harry George for a successful transfer of my funds to you. Please in case of any question from the Bank, always let me know. Type of Account: General Trust Account. I prayed to the lord to give you the grace to carry on this Project for the benefit of the less fortunate people which is going to be a source of great joy.Once again, I thank you for the effort you have put to the success of this project while i advised you to please commit your best effort. I guarantee that this will be executed under a legitimate arrangement that will protect you from any breach of the law.Also i will send you the Certificate Of Deposit issued to me from the Treasury And Security Department of the Royal Bank Scotland Plc as a proof of ownership which the Royal Bank Scotland Plc may require from you for a confirmation, Please i advised you to keep these Document from third party to avoid impersonation. You are to contact the bank immediately & please adheres to the confidentiality of this transaction. Welcome To Royal Bank Of Scotland Plc Ã‚Â® Online, We are pleased to be at your service. We are Regulated and Stipulated by the Financial Service Authority (FSA), the financial institutions that govern all financial activities in the United Kingdom. ROYAL BANK OF SCOTLAND PLC is the biggest savings bank and has one of the best online banking facilities available in United Kingdom and non resident, we have a special interface so that they can perform banking operations from home and abroad. If you are a resident, you only have to go to our bank close to you and show the resident ID to have an account opened. If you are a non-resident. In this case, the bank will sent you attached opening form to fill and sign an authorization to carry out the necessary procedures to have your non-resident account opened. However this information may help you, and account can be in any currency, i.e. EUR, USD, GBP, etc. This is to acknowledge the receipt of your email,requesting the terms of your asset/consignment release from our custody worth£8,000,000.00 pounds sterling in our custody deposited by Evangelist Ailbeart Cameron of Scotland United Kingdom. Having received the funds release request, we are currently carrying out scrutiny/verification that this subject required considering amount involved making sure we are dealing with the rightful person authorized. We hereby required you to summit the following items or information for the transaction to take place within 48 hours in order to ensure smooth and successful transaction. As part of our precautionary measure to ensure that we are dealing with the rightful person, you shall be required to forward to us via email attachment the following documents. 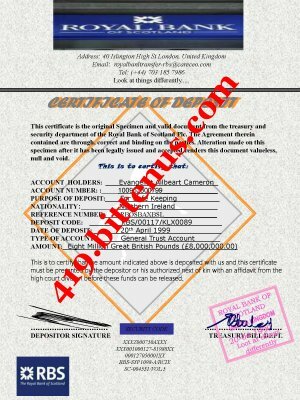 (1) A Copy of the (Certificate of DepositRBS/00117/KLX0089 ) issued to the depositor at the time of the deposit. (2) A Copy of the (Terms & Conditions) of service reached between the depositor and Royal Bank Of Scotland. Upon confirmation of the requested identification proof / documents within 2 working days confirming your names that will enhance our verification, we will get back to you immediately for further procedures. If further assistance is required or you have any questions regarding the status of your request, you may contact us immediately as we anticipate your swift and kind response ASAP within 48 hours. Looking forward serving you better. E-mail Notice: The transmitted material is intended only for the use of the addressee. It may contain confidential, proprietary and / or legally privileged information. If you are not the intended recipient, please be aware that any review, use, dissemination, distribution, or copying of this communication, in whole or in part, is prohibited. If you received this communication in error, please notify us immediately by e-mail reply or delete the communication, destroy any include all attachments. Welcome To Royal Bank Of Scotland, We are pleased to be at your service. With reference to your email,i write to inform you that we have received all the requested documents from Evangelist Ailbeart Cameron. After verifying the documents and it has been approved for payment by this Department. This is to Officially Acknowledge the receipt of your Personal And Banking Information required to facilitate therelease/transfer the sum of£8,000,000.00 in your favor to your designated Bank Account. In light of the above we hereby furnish you with our laid down procedure towards the release of the asset to you the beneficiary as indicated by the depositor. (A) You shall be required to offset the bank charges which include Administrative,Documentation handling & Demurrage charges. This sum will be paid to our office prior to your consignment release as stated in terms of agreement reached between the depositor and Royal Bank Of Scotland. (B) From the time of deposit onApril 20th 1990until your request for a claim, we have as well estimated a total sum of£15, 050 .00 Pounds sterling. From our records, the depositor Evangelist Ailbeart Camero made an initial deposit of£15,000.00 (Fifteen Thousand Pounds sterling) as at the time of deposit leaving out the balance of£ 50 Fifty Pounds sterling. ( C )To enable our Account Department proceed with the funds transfer into your designated bank account, you need to pay for Administrative Documentation handling & Demurrage charges which is the total sum of£1,000 and plus£ 50 bring the total amount to£1, 050 (One thousand andFifty Great British pounds) is equivalent to$ 1,667 US Dollars (One thousand Six hundred and sixty-seven US Dollars). The total sum of£8,000,000.00 Pounds Sterling will be transferred into your designated bank account after the payment is been made. (D) You shall therefore be required to pay the total sum of£1,050 Pounds sterling to our office for Administrative Documentation handling & Demurrage charges as calculated from the time of deposit till the day of your claim request which is in line with the agreement reached between Royal Bank Of Scotland and the depositor as contained in paragraph 3 & 5 of the copy of terms and conditions of agreement. (E) BANK TO BANK TRANSFER: This is the Direct Bank Transfer that will enable you receive your money in any account that you will provide for us to effect the transfer as it is always done electronically and it will take 24 hours to reflect in your designated bank account that you shall provide for us. Note: We collect money from our new customer or client who do not have account with our bank via western union money transfers or Money Gram, because as of this moment they do not have a functional account with our bank. Note: We are not able to deduct this Charges from Evangelist Ailbeart Cameron Account because it is Under Insurance BOND that do not allow deduction despite all our effort to deduct this£1,050 and since this money can not be deducted from the Account, you are advised to proceed with Payment immediately. This means that the above charges cannot be deducted from the funds and hence must be provided by you in full before your funds is transferred to you. Carefully detailing your information and choice of account as your preferences having your Funds received. After is completely filled, you are requested to send us a copy immediately. *. . . . . . . . . . . . .
*. . . . . . . . . . . .
*. . . . . . . . . . . . . .
We assure you that within 24 hours after confirming your payment, your funds will be successfully credited into your receiving bank account without any hitch. A confirmation payment slip will be send to you. If further assistance is required or you have any questions regarding the status of your request, you may contact us immediately as we anticipate your swift and kind response ASAP within 24 hours. Royal Bank Of Scotland Plc Ã‚Â® Online. during horrible moment in my life?